February 26, 2014 (San Diego)--It’s been one of the driest winters on record, but finally some significant rain is headed our way. 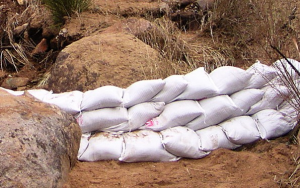 Once again the County of San Diego is making free sand and bags available to residents in the unincorporated areas. Residents just need to bring their own shovel. Locations are below, along with links to find updates on road conditions during this storm and other emergencies. Department of Public Works (DPW) crews will also be working on county roadways during and after the storms. So be sure to watch out for crews and equipment, and slow down. If driving in the mountains, wait for the storms to pass before going up to enjoy the snow as DPW crews will likely be plowing roadways around the clock. Don’t park on the highway and don’t allow children, or yourself, to sled down the hill and across the roadway. You never know when a snowplow will be coming around the curve. In the county there are several areas that are prone to roadway flooding. The three most frequent are the dips at Quarry Road, Sandia Creek in the north county, and County Club in Harmony Grove. Gates at Quarry Road Dip drop down automatically when activated by sensors in the stream. DPW crews will post road closures at Country Club, Sandia Creek and any other areas where unsafe driving conditions exist. You can monitor the status of the dips by webcam. Never cross a flooded roadway if you cannot see the pavement. Even a few inches of water running at the right velocity can sweep a car, and even a truck, and its occupants off the roadway and downstream. You don’t want a swift-water rescue as part of your weekend activities. During and immediately after heavy rainfall, do not go near storm channels, creeks or streams. It’s always a good idea to carry chains if planning a trip to the mountains. 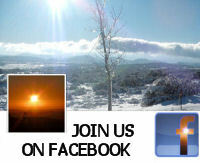 Chain controls, road condition updates, and other safety advisories are posted on the DPW social media pages: Facebook.com/SDCountyDPW and Twitter.com/SDCountyDPW. During severe weather events, the DPW Emergency page is activated with the latest information. http://sdcdpw.org/emergency. Once again no sandbags east of Alpine. Note to San Diego County Government. There several thousands of square miles of San Diego County East of Alpine and along Hw 94! People actually live here! How about some in those San Diego County Fire Authority Stations you keep bragging about?